NASHIK: The NMC’s standing committee has decided to meet new municipal commissioner Tukaram Mundhe over various basic civic works which are pending for a few months. During a meeting on Wednesday, standing committee members had alleged that the administration has not issued the work orders even after finalisation of tenders. Standing committee chairman Shivaji Gangurde said various basic civic projects like roads, lights and water, which are needed to be implemented at the earliest, are yet to be implemented. “We will meet the municipal commissioner on the issue and urge him to push the pending works,” he said. Committee member Prravin Tidme alleged that the administration was pushing select works in some ‘prabhags’. “There are many works which are pending for many months. The tenders process for most of the works has been completed, but the works are pending,” said Tidme. Echoing similar views, member Suryakant Lavate alleged that the administration was showing partiality to some corporators when it came to issuing work orders. Lavate said the administration has stopped works for installation of LED bulbs from corporators’ fund following the government circular that the bulbs will be installed by the government-appointed agency Energy Efficiency Services Ltd. But, according to the circular, new works after January 12, 2018 will be carried out by the agency. Hence, the administration should not stall the process for installation of LED bulbs in various prabhags, which were approved by the civic body, he said. New playgrounds: During the meeting, the panel also gave approval to civic works worth Rs 3.5 crore, including development of three playgrounds on open spaces in Nashik East division. One playground would be developed at Agartakali in prabahg no. 37 by a private agency at a cost of Rs 1.23 crore. Two playgrounds would be developed in prabhag no. 40 at a cost of Rs 1.06 crore and Rs 48.82 lakh. NASHIK: Illegal tree felling in open forest area seems to have brought down the green cover of the district in the past two years. Latest findings in the state of forest report show that the forest cover of Nashik has shrunk from 1,089 square km in 2015 to 1,068 sq km in 2017. The report is prepared by the Dehradun-based Forest Survey of India (FSI), an arm of the Union ministry of forest and environment. The FSI conducts survey of the forest cover across the country biennially to access the country’s forest resources. The forest cover assessment is a wall-to-wall mapping exercise based on remote sensing supported by intensive ground verification and field data from National Forest Inventory. The survey found that the green cover of moderate forest area of Nashik district has decreased by one km. The green cover in the open forest area — the land with tree cover of canopy density between 10% and 40% — has gone down by 20 km. He said that reduction of forest cover happens when the trees are cut or forest land is allotted for government projects. But none of these have happened in Nashik district in the last couple of years. Environmentalists backed the findings, claiming that illegal felling, large-scale encroachment of forest land, utilisation of forest land by tribals for cultivation were leading to constant depletion of the green cover in the district. “One of the major reasons for the reduction of the forest cover is illegal felling of trees in forest areas. The forest department needs to keep an eye on illegal felling of trees in tribal areas such as Peth and Surgana,” said city environmentalist Rajat Pandit. According to him, there have been some cases in the recent past when leopards have intruded in Nashik city areas. “Such incidents are happening since the forest cover is reducing and the big cats are forced to enter the city in search of food,” he said. Echoing similar views, environmentalist Devang Jani said encroachment in forest land is steadily increasing in the district. “Moreover, forest land is being used for government projects, which too can lead to reduction of forest area,” he said. Some green activists gave the example of the Mumbai-Nagpur expressway project, for which, 57 hectares of forest land in Nashik district would be acquired. “The state government’s policy of planting 10 crore trees is not yielding results. The trees are not maintained properly or protected after plantation. The reduction in forest cover is the government’s failure to save and increase the green cover,” said Jani. 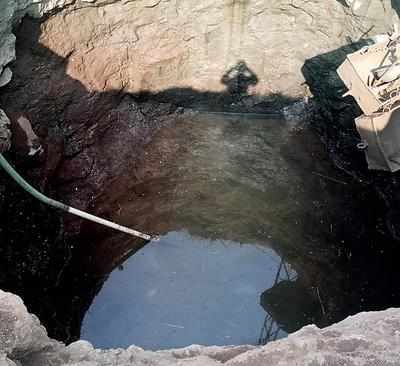 Nashik: Minister of state for urban development Ranjit Patil on Thursday expressed concern about the sewage and waste management in the city and said that unless these issues were resolved Nashik cannot be a smart city. Patil took a review of all the state projects here and their funding. He told media persons after a meeting with municipal commissioner Tukaram Mundhe, civic officials and the smart city team that all the pending projects like roads, LED lighting, health, schools, sewage treatment plants, smart city projects, sewage and garbage will be sped up. “In case of the STPs, unless the sewage and waste management are not planned, then the city cannot be a smart city. Even the Prime Minister has given instructions regarding these issues,” said Patil giving a strong message to get rid of the lacunae in these cases. The minister who also took a review of the staff shortage and vacant posts said, “The chief minister will be taking a decision on the staffing pattern in a few days. That is why I came here to take a review.” He promised that the long-pending issue of staffing pattern would be resolved in a week. About the approved posts, he said those were expected to be filled but even if there was a delay in appointments the work has to be done by the existing staff and it should be done properly. “I will convey to the government whatever is pending or is delayed and will do whatever is to be done. The municipal commissioner also can fill the posts that are vacant,” Patil said. The NMC currently has 7,090 posts. According to the staffing pattern, a proposal for 7,656 new posts has been sent to the state government. The proposal was prepared on the basis of the approved posts in groups A and D and also new posts. Patil also said that the hawkers’ zones would be operational in the city soon. Every part of the city would have no hawking zones and hawking zones. The minister also took a review of Pradhan Mantri Awas Yojana and said that all these projects would be pushed ahead. About parking-related issues, Patil said suggestions could be given on the issue and he would look into the matter. Nashik: The civic administration is contemplating removal of concrete from the Godavari, for which a committee will draw up an action plan, said municipal commissioner Tukaram Mundhe on Monday. “A lot of things are going on with respect to the river and some are in the pipeline. Encroachments are being removed with in a big way. I am assuring that everything will be done for the benefit of the river. Godavari is after all Nashik’s identity, its lifeline,” said the new civic chief. After his first visit to the river banks, Mundhe had issued instructions to remove all the encroachments, including the old vegetable market, following which the anti-encroachment department swung into action. About the high court’s directions based on the recommendations to remove encroachments on the blue line of the river, he said he would see the orders and that the water resources department would decide on that. “There is lot of concrete in the river. On the basis of the recommendations by the Central Research Institute and NEERI, many positive steps with respect to the Godavari will be taken,” said Mundhe. A civic official said that after Mundhe’s instructions, encroachments were being removed every day, including the vegetable market. “The NMC established a vegetable market for vendors who sit on the river banks. They have been refusing to shift to the nearby marketplace saying that people will not go there. However, once people come to know that the market has been shifted, they will go to there. We will be shifting the vendors. For the past couple of days, we have been evicting them from the river banks,” said the officer. Environmentalists, experts and the civic administration have been debating the issue of concrete for a long, even as petitions have been filed in the high court and National Green Tribunal pleading for its removal. Petitioners and environmentalists are also insisting on restoration of natural drainage pattern of Godavari in Trimbakeshwar and Nashik, rejuvenation of natural streams and ponds that are covered with concrete so that the floodwater will be able to flow naturally without obstacles as this slab is in the blue line. Mumbai: The state government has signed 580 MoUs with various parties for investments to the tune of Rs 4,325 crore for Nashik region during three-day global investors’ summit ‘Magnetic Maharashtra’ in Mumbai. The region consist of five districts — Nashik, Ahmednagar, Dhule, Nandurbar and Jalgaon. Once these units start functioning, they will generate 18,331 jobs. Nandurbar has got a large project involving investment of Rs 700 crore by Genus Paper and Board Ltd, which will be setting up a manufacturing plant there. “Of the 580 MoUs, the maximum projects are in the SME sector,” sources in the state industrial department told TOI on Tuesday. A total of 144 MoUs were signed for Nashik district for investments worth Rs 1,986.39 crore, which will generate 8,689 jobs. The Food Processing Park, adjacent to Vinchur Wine Park, has attracted maximum investment of Rs 950 crore with 15 food processing projects to be set up over there. Dhule district attracted 83 MoUs for Rs 399 crore investments. Almost all the projects are in the SME category. This new investment will create 2,993 jobs. Nandurbar district has attracted 26 units at a total investment of Rs 729.77 crore, including the Rs 700-crore project of Genus Paper and Board Ltd. A total 162 SMEs have signed MoUs for total investment of Rs 334.31 crore for Jalgaon district, which will generate 2,662 jobs. However, there is a feeling among a section of the industrial fraternity that Nashik region got very less investment proposals as compared to the total investment the state government attracted through MoUs, which is Rs 12.10 lakh crore. Marathwada and Vidarbha have attracted maximum investment. During the valedictory function of ‘Magnetic Maharashtra’ on Tuesday, chief minister Devendra Fadnavis made it clear that his major focus was to fetch investments for industrially backward areas like Marathwada and Vidarbha. “The investment of Rs 700 crore in Nandurbar is a part of the government plan to give projects to backward areas,” Fadnavis added. Nashik: A green carpet of moss-like growth has taken over the Godavari riverunder the Ahilyabai Holkar Bridge and extends till Anandwalli. The efforts to clean the river seem to be restricted to the downstream areas, where rituals are performed. The Nashik Municipal Corporation’s health department had swung into action in the first week of February and cleaned the ponds of the river, including Ramkund. They had drained all the water from the ponds and cleaned them for two days. However, a huge carpet of green growth has taken over the river from Ahilyabai Holkar Bridge to Anandwalli. This, environmental activists fear, could develop into water hyacinth. “The condition of the river has become very bad from the Holkar bridge to Anandwalli. The water levels have dropped very low. If this is the condition of the river in February, then what will happen in summer,” said environment activist Devang Jani. “Mosquitoes have already started breeding. The ecological flow of the river has to be maintained,” he sad, adding that he would soon meet officials of the water resources department in this regard. He said that as per the National Environmental Engineering Research Institute’s recommendations water has to be released periodically from Gangapur dam. “If this moss comes in contact with sewage, then it could develop into water hyacinth. In Someshwar, nullahs are directly connected to the river, effluents and sewage from industries is also released. In Malharkhan, there is sewage leakage. If there is water hyacinth growth, then it will be difficult to control,” Pandit said. An NMC official said they are taking all efforts to clear the growth. “The moss is being cleaned by 32 men of a private agency. We divided the river into four stretches and eight men are cleaning each stretch of the river with the help of boats. Water level has gone down significantly. Since the moss is in breeding stage, it is little difficult to remove it,” the official said. The official added that they have cleared Gharpure Ghat and on Saturday, teams had gone to Anandwalli as well. Nahsik: The Maharashtra Industrial Development Corporation (MIDC) has decided to act tough against industrial plot owners for illegally subletting their plots to other parties. It recently served notices to 57 such owners for allegedly subletting their plots illegally. On Monday, the MIDC kick-started a phase-wise survey in industrial estates to identify plots that have been sublet illegally. The exercise started from the Satpur industrial estate. The survey in the Satpur MIDC estate is expected to be completed in a couple of weeks. Thereafter, the MIDC will start its survey in the Ambad industrial estate. The survey will be held in other MIDC areas. The MIDC wants to find out various details through the survey to check how many industries are operational on the land allotted to them. Moreover, the MIDC will also check whether water connections given to industries are utilised and effluents are not released on open spaces and whether they are releasing the effluent into a soak pit. The survey comes after the authority found industrial owners had given their units or spaces on rent to other industries. The authority had served notices to 57 such units for unauthorised subletting around two weeks ago. An official said that apart from subletting, they had found industrial plots used for commercial purposes as well. “Some showrooms had been started even though the land was meant only for industrial purposes. They were to start industrial operations there,” the official said. The MIDC had served notices to six such showrooms using industrial land for commercial purposes. “Three owners had moved court against the notices and the matter is currently being heard. In case of another owner, the state industries department has given a stay in the matter. We have sent notices to owners of the two remaining showrooms, giving them an ultimatum that if they continued with commercial activities, their units will be sealed,” the MIDC official said. According to the official, there are also many plots lying idle. Industrial sources said investors or non-industrial persons have put up sheds and small structures on several plots at the MIDC’s industrial estates and have obtained the Building Completion Certificates (BCC) from the MIDC as well. However, these units have not gone into production for many years. This is an ongoing trend at industrial estates across the state. According to MIDC norms, obtaining BCCs is mandatory but there is no provision in norms, where they go into industrial production. As a result, several industrial plots are lying idle as they are occupied by non-industrial persons for investment purpose and industrialists are not getting plots because of this. Another MIDC official said, “During the survey, it will also be found out how many industries have got BCC, but they did not start industrial operations. We have plans to get all the details through surveys in Satpur, Ambad and Sinnar industrial estates of MIDC shortly. Nashik: The state government has asked the Nashik Municipal Corporation (NMC) to submit a proposal for redevelopment of gaothan areas. MLA Devyani Pharande has met the chief minister on the issue on Monday and has suggested a cluster development scheme for gaothan areas. The gaothan areas are underdeveloped with many old buildings, wadas and narrow lanes. A cluster development scheme would change the face of the area and would also leave some breathing space. The administration will have to table a proposal at the general body meeting and form a policy. The resolution will have to be sent to the state government for approval. Approval will also have to be sought from the government for changes in the DCPR. Nashik: During an awareness programme on Swachh Bharat Abhiyan at Dhanlaxmi School and Junior College, founder president of the Nirmal Gram Nirman Kendra, Nalini Navrekar propagated the re-use and recycle of materials and zero-waste generation. Navrekar, who has been practising eco-friendly methods for the last 25 years, said zero-waste generation will save crores of rupees. She was speaking at the programme held on Tuesday by directorate field publicity, ministry of information and broadcasting, government of India on Tuesday. The Centre is conducting a number of such programmes across the country under the Swachh Survekshan 2018. Mayor Ranjana Bhansi, local corporators Bhagwan Donde and Pushpa Avhad, Nalini and Sandhya Navrekar were present at the programme. No government officials were present. The event started with a cycle rally by students to create awareness on cleanliness. A rangoli contest was held where messages of clean and green environment and save the girl child were conveyed. A street play on cleanliness was performed at school campuses. Nirmal Gram conducted a workshop on the concept of zero waste. Navrekar who received the Nirmal Gram award from the president of India, a life achievement award from Pune University and Vasant Pawar Smriti Samman said zero-waste generation was the solution to pollution and finance related issues. “We clean our houses and dump the waste outside. India’s image is clean people and unclean country. When we take waste outside our homes we feel our duty is over and the civic body will take care of it. We need 150 acres of land for municipal solid waste which translates to an expense of around Rs 150 crore. More funds are needed for garbage collection vans, manpower etc,” Navrekar said. She added that the municipal solid waste plant should be decentralised. NASHIK: The Centre has given in-principle approval for construction of a flyoverbetween Dwarka and Datta Mandir. The feasibility report for the project is being prepared and would be submitted to the national highway authorities soon. 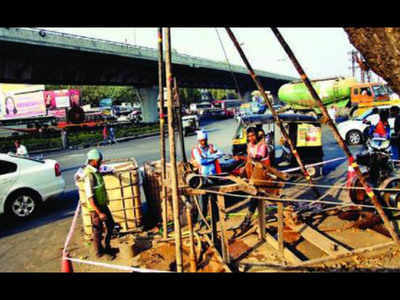 The technical staff carrying out the survey said they have conducted the survey at 14 spots of the 5.9-km stretch and that they would three more locations are remaining between Dwarka and Sarda Circle, which means the overbridge would stretch till Sarda Circle over the existing flyover on the Mumbai-Agra highway over Dwarka junction. The technical staff said, in all likelihood, the flyover of approximately 6.5km would stand on 203 pillars. In November 2016, Godse had announced that the 5.9-km stretch from Dwarka to Datta Mandir would be converted into a highway and a flyover will be constructed on this stretch at a cost of Rs 500 crore. Subsequently, the NHAI had appointed a consultant for preparing the detailed project report, which is in the last stage. The stretch connects the Mumbai-Agra highway (NH-03) and the Nashik-Punehighway (NH-50). It not only gets traffic from the Mumbai and Dhule sides, but also from Pune, Ahmednagar, Sinnar and Shirdi. The stretch witnesses bumper-to-bumper traffic throughout the day and long queues of vehicles at the six junctions on it. Motorists have to spend at least 15 to 20 minutes during peak hours to cover the 6-km stretch. Nashik: The civic administration continued with its anti-encroachment drive on Saturday by demolishing structures set up on the roadside at Panchavati area and Raviwar Karanja. The drive began from Panchavati Karanja till the squad reached Hirawadi and removed encroachments from Raviwar Karanja. These areas in the old city have encroachments since decades though the owners have been evicted time and again. Hawkers have refused to shift to the zone designated for them. “We have been carrying anti-encroachment drives on a regular basis since the 2 years but we have stepped up our drives now. We have already sent public notices and even people are aware of that we have been carrying out such drives regularly,” said an NMC officer. He said besides kiosks and handcarts, the encroachment department also did away with tin/asbestos sheets, angles and other material that were an extension of shops in these congested areas. “These encroachments are on the roadsides or footpaths. We appeal people to remove the encroachments on their own and cooperate with us or else we will remove it. Now onwards, NMC will make the drive more stringent,” said the official. The drive continued throughout the day. Kiosks, handcarts, tin and asbestos sheets, angles, boards etc were confiscated by the civic body. Nashik: Mayor Ranjana Bhansi on Saturday sent the resolution of 18% property taxhike to the municipal secretary after rejecting municipal commissioner Tukaram Mundhe’s recommendation of 33-82% increase. The civic administration had proposed property tax hike of 18% to the standing committee last year and it was approved. When the resolution of the standing committee was sent to the general body for approval, Mundhe raised it to 33-82%. Mundhe had recommended 33% increase for residential properties, 64% for non-residential and 76-82% for commercial properties. According to the rules, the administration can make demands and Mundhe had proposed changes in the amount on capital-based rate. But the general body rejected his capital based hike and made it rateable. “The proposal of the administration to the standing committee was sent to the general body. Mundhe had also attached a recommendation docket wherein he raised the tax rate. The general body approved the docket tabled at the standing committee. The modified docket of Mundhe has been rejected,” said the mayor . She added that the general body approved the tax hike but not the one suggested by Mundhe. Nashik: With joint efforts of the villagers, air force, forest department and an NGO, Borgad, situated in the east Nashik forest division, has returned to life. Dry and barren for almost a decade, the villagers finally revived the area after digging four wells. The wells are full of water that will last till summer. A fortnight back, the villagers under the guidance of the NGO constructed four wells that are flowing with good quantity of water. “The villagers dug four wells that are full of water now. The wells are 15-20 feet deep and have been constructed just outside the periphery of the forest. The water will be used by the villagers now that summer has arrived,” informed former wildlife warden and founder of NSCN, Bishwarup Raha. Borgad has been developed into a conservation reserve, which earlier saw rampant deforestation. It is now an ecologically rich place. The joint efforts involved the villagers in the conservation process with massive plantations. There has been significant rise in the flora and fauna has been noted by the NGO. Neem, mango, sitaphal, amla, jatropha, karavanda and badam were planted here with the help of the villagers, school children. The villagers were assigned the responsibility of conserving and guarding the area. Number of birds, blooming flowers, insects and jungle animals are also seen in this reserve. The availability of food for the villagers has also increased. “Kartolis, a kind of 'karela', 'karvandas' (Indian blue berry) and wild cucumbers grow aplenty now, particularly during the rainy season. A lot of migratory birds beneficial to man like wobblers and fly cattle too can be found here in abundance,” Raha said. 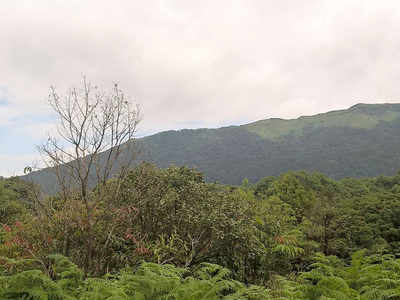 Borgad, which, until a decade ago was a niche for rich wild biodiversity due to its favourable ecological conditions, had been destroyed by the locals for firewood and timber. Borgad is located near Tungaldara village in Dindori tehsil. Nashik: Residents of Nashik can now apply for any certificate issued by the revenue department from the comfort of their home and get the documents delivered to their registered email address. The district administration from Monday said that henceforth all applications would be received only online – either the citizen applies from home or through Mahaonline Centres of Aaple Sarkar or Common Service Centres (CSC) by Government of India or even through the internet café. The services of Setu – the link between the people and the district administration – will thus be scrapped. “Now, there will be no movement of paper from applicants willing to get certificates for any of 16 services from the revenue department. They will get certificates in their registered email address or in a physical format as desired with a bar code on the same,” district collector Radhakrishnan B said. Briefing the media, the collector said that the administration had put in place 83 centres within the Nashik municipal corporation limits at this point of time and another set of 50 odd centres would come up soon. “There were complaints about Setu operators not managing applications according to seniority, about forms in physical format being sold at higher costs, about middle-men making money etc. Now, no one will have to come to Setu. Citizens can file applications online, scan and upload documents, pay through the payment gateway and get the digitally-signed certificate in stipulated time,” he said. As of now, Setu will continue to perform in areas outside Nashik taluka. From Tuesday, Setu will not entertain any applications for caste certificates, income certificates, domicile, solvency, heir ship certificates, small land holder, etc. While the applications already registered will be processed and delivered as per the time schedule. “Online services rule out any scope of middle-men in the process. If the people are taking help of service centres, they will have to pay the pre-defined charges – the same as those paid in Setu. People need not travel to Setu offices, or district collectorate only to get their certificates,” Shashikant Mangrule, deputy district collector, said. The certificates generated have a bar code and they can simply be downloaded and presented to the department concerned. “In the era of digital signatures, the certifcates printed on typical paper are now outdated. A computer printout with a bar code and website address to authenticate validity of the same is the valid document. This is known to every government office,” the deputy collector said. Nashik: The civic body has slapped offences against those who had resisted the anti-encroachment drive in the old city area on Monday morning. The Nashik Municipal Corporation (NMC) has been pepping up such drives and had appealed to people to remove the encroachments on their own. On Monday, the Nashik West division evicted flower sellers on both sides of the road at Saraf Bazaar area and had confiscated material from them in three trucks. In addition, the NMC has also filed first information report at Sarkarwada police station against those who resisted the drive. In the afternoon, encroachments were removed from the central bus stand area, Meghdoot shopping centre and taxi stand. The sheds and platforms of around 15 shops on both sides of the road were removed. The NMC’s encroachment department has removed handcarts and kiosks also. “This kind of drives will continue in all divisions and strict action will be taken against roadside vendors and kiosk owners who occupy roadsides and footpaths. We will also file offences in police stations against such persons,” an NMC official said. He further said that similar action would be taken against unauthorised constructions on roadsides and on parking spaces. “Such persons should remove the encroachments/unauthorised constructions on their own and cooperate with us. Or else we will take strict action against them. We have been warning citizens again and again through public notices,” said the official. As pune still have round place to expand with almost same price as nashik so there will not be count nashik for IT .